Sonja sent this beautiful hand-made bag and a sweet card. And I love this bag! Look how perfectly sewn it is. Oh, how I admire the sewing ones! and I love polka-dots, too. but I think it works. It came just in time for a college trip we are taking with Little Bug next week. You see, I needed a bag to carry a crochet project. to work on during travel time. Thank you so much Sonja!!! And make more roses until something comes to me. or until y'all tell me what I should make with these. The Swiss Mohair looks mighty lovely too. Cute flowers you clever girl. Oh,you are sooo lucky ;0).I like this little bag so much. Good to have nice friends. En tout cas j'aime beaucoup les couleurs. What beautiful colours. The best projects are the ones that just happen. Still working on my sewing project and more besides. Kjekt å sjå at posen er komen i bruk allereie:) Artig med den tilfeldige fargematchen. Blir spennandes å sjå kva du har tenkt å bruke alle dei fine hekla blomstrane til. Love your new bag. 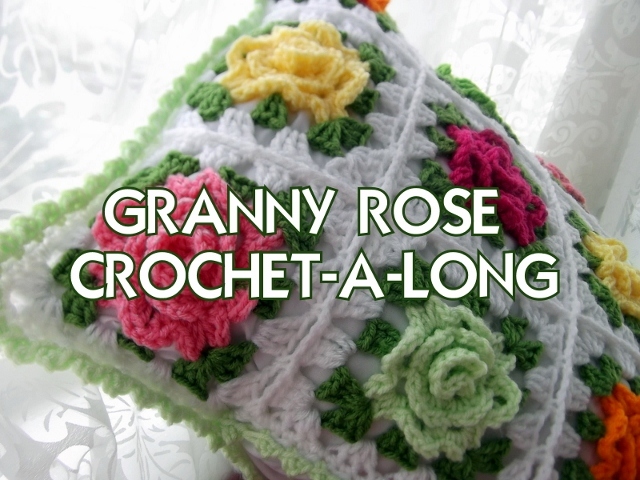 I think you should make granny squares out of your roses for an afghan. I am so glad you all like the bag - isn't it swell? Yes, a shawl is the direction I have been thinking...however, I have not connected one before so I will have to get more info on that. Perhaps, Cogaroo can hook me up. A blanket would be pretty but might be too delicate? Thank you all for the time and interest in this post. So sweet! Hello. 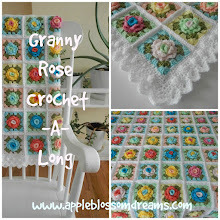 I recently found Annette's blog, My Rose Valley, and read her lovely blog for hours! I decided that since I enjoyed her blog so much, that surely she would have more wonderful blogs for me to enjoy on her blog roll. Which brought me to your blog. Oh my goodness...I read it all the way back to your first post. It did take a couple of days. I enjoyed each and every post. Such beautiful crochet. I saw a rose afghan at a friends house that she found at a thrift store. I was in love immediately with it. Now, after seeing yours, I am eager to make one of my own. Wow, at first I thought she sent the roses too ... they coordinate so perfectly with that lovely, lovely bag. A scarf, shawl or pillow ? 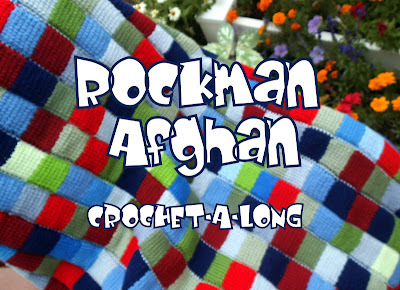 Stash-Buster #27 - Happy Scrappy Afghan Ta Dah!